The location is perfect. The first day I did not realize how close evrything was but after I was walking almost everywhere. The only thing that is confusing is the tickets to ride the metro, bus and trolley was kind of confusing. I bought a ticket in the street next to the entrace to the metro when i went down security told me that the ticket did not work and told me to buy it inside the station. Never really found out the which one was the correct one for the trolley or bus but it was okay. Worth it. Not expensive yet has everything that a good hostel requires and even included breakfast, which is awesome. Such a great atmosphere, and a central location so that you can walk basically anywhere. Staff were friendly and helpful. Rooms are a bit small but the lockers are big so that was a plus. The common area is nice, and always full of people to chat with. The only downside was that you aren't allowed to use the kitchen to cook your own food on nights when the hostel makes a dinner, or during the morning, which I found really frustrating. Fantastic location, staff were friendly and helpful, breakfast was really nice. Only complaints are that the bathroom had a funky smell when we got there and the heating wasn’t the best, one window wouldn’t close properly and had no blinds. 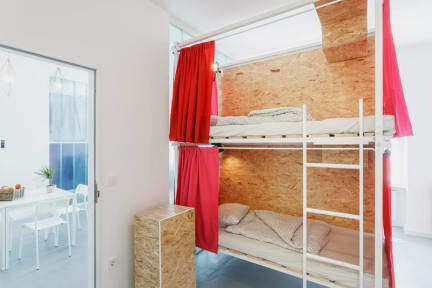 Good choice for budget accomodation. Decent hostel, great location, good vibe. Only complaint was that I put my washing in and found out 3 days later they hadn’t even sent it up to be washed, even though they have a “24 hour service time”. They ended up rushing it before my flight and I didn’t have to pay which was nice. Would stay again. I can’t express how terrible our stay was. The staff we rude, couldn’t be bothered & didn’t talk to us politely. The showers &the room were never cleaned, dirt everywhere & a constant bad smell. There wasn’t any curtains on the windows so it was always light &made for an awful sleep. THE NOISE AT NIGHT was beyond disrespectful & the staff wouldn’t help. Lastly the toilet smelt like sewage. After 3 complaints nothing was done. The toilet lifted off the ground & there liquid came out the base too. Security was okay. People could let people in at anytime even though there was a security code. The rooms on the 3rd floor did not close and was open to the rest of other rooms. There were bugs on the floor. The bathrooms are tiny. The hostel charges for everything. The lockers were small and not secure. The rooms were hot and uncomfortable. The staff were horrible. They were not friendly nor provided any help. They appeared bothered by all of the guests and should not be in customer service.